Giving Hope Lawn Management has been the leading landscape maintenance service in the area since 2011. From trimming bushes to installing landscape mulch, we provide all the services you need to have a beautiful landscape. Proper landscape maintenance takes more than just a little raking and mowing. But if you’re like many people, you just don’t have the time to care for your plants the way that you should. Overgrown bushes and shrubs, tree leaves, and scraggly grass all make for a long time spent outside. And when you don’t have the right tools or equipment, you could waste hours without results! Instead, you can always depend on Giving Hope Lawn Management for complete landscape maintenance solutions. We keep your yard looking its best for less! Call today for your best choice in affordable landscaping services. Since 2011, we’ve kept Richmond, VA, greener! Landscape maintenance should not only leave lawns looking great, but it should also promote better overall plant growth. That happens with better trimming, pruning, and scheduled care services. By removing overgrowth, weeds, dead plant growth and thinning thick branches, your lawns will continue growing without much effort. Because we allow more sunlight and oxygen to reach more limbs and plants, your entire yard receives the nutrition they need. No matter which types of plants you have, or the overall appearance you’re trying to achieve, our best landscapers can help you. Contact us to learn how we can keep your lawns in pristine condition! Bushes are ideal for creating a privacy fence that doesn’t take away from your yard’s natural appearances. Without the need for wooden planks or vinyl fencing, you can keep prying eyes at bay. However, all bushes require trimming eventually, or else the overgrowth starts to impact their health. Thicker plants begin blocking out sunlight and make it harder for oxygen to move between plants. Instead, bush trimming leaves your plants even, smooth, and professionally manicured. They’ll look better and enjoy improved health for longer! Call today for your best option in professional bush trimming services. We can deliver the results you need each time! Shrubs typically grow flowers, and unlike other plants, they don’t produce divided sections or split into additional plants. These plants are commonly evergreens, although there are different types you may have as well. Because shrubs use one root system for the entire plant, they can be especially susceptible to harm. But with the proper maintenance, they’ll continue growing healthy for a long time! Don’t let just any landscaping service handle your shrubs. Instead, let us give them the best care possible for less. Contact us today for your best shrub maintenance services. We guarantee better results than anyone else! Your yard deserves a team that offers complete lawn care maintenance solutions. When you call Giving Hope Lawn Management for your home or business, we promise only the best in local landscaping options! 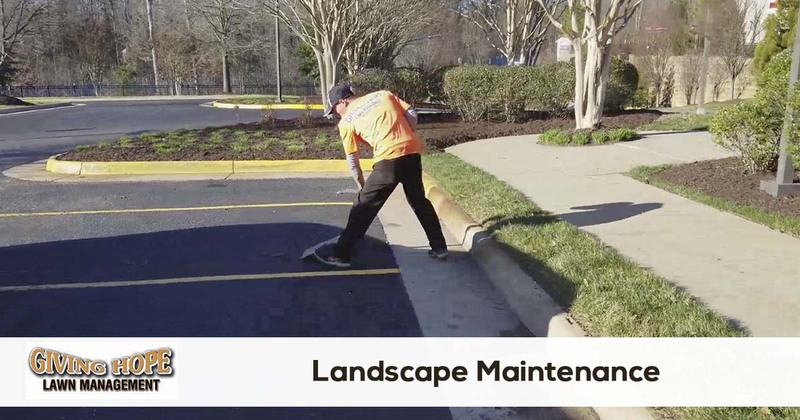 We offer better monthly landscaping and one-time cleanup maintenance. Contact us for a quote and learn how we can save you more on your total lawn care services! Ready to schedule your landscape maintenance service or just need a free quote? We make it easy to get a quote and schedule your service. You can get started by requesting a quote online or by giving us a call.